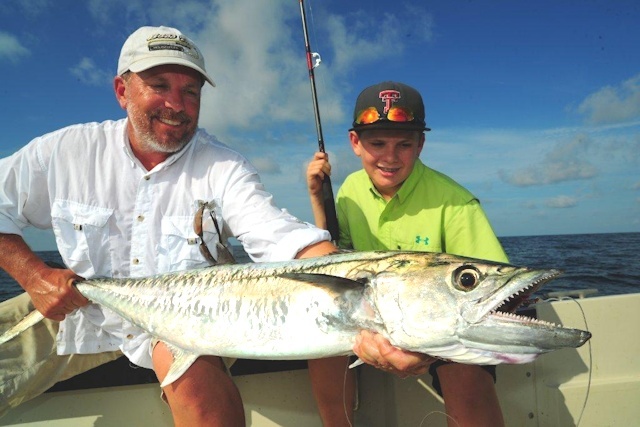 information and pricing of fishing trips. Scroll down for customer feedback. Fishing is based on a lot of factors such as location fished, time of year, air temperature, water temperature, tidal movement, water clarity, current, wind direction and velocity, all which affect fishing. For over four decades I have studied the movements and migrations patterns of Tarpon, Sharks, Kingfish, Trophy Speckled Trout, Redfish, Bull Redfish and Flounder. Thousands of hours spent exploring the waters around Galveston Island and keeping very detailed records have enable me to accumulate an unsurpassed inventory of great fishing spots I call "PAITITI SPOTS." I guarantee to have you in the right place at the right time to try your luck with these great fish. The rest is up to you as the fishermen doing the fishing and the person who controls the weather, which incidentally is not your fishing guide. With that said, here are a few feedbacks from some of our fishermen, fisherwomen, fishing families and best of all, fishing kids. 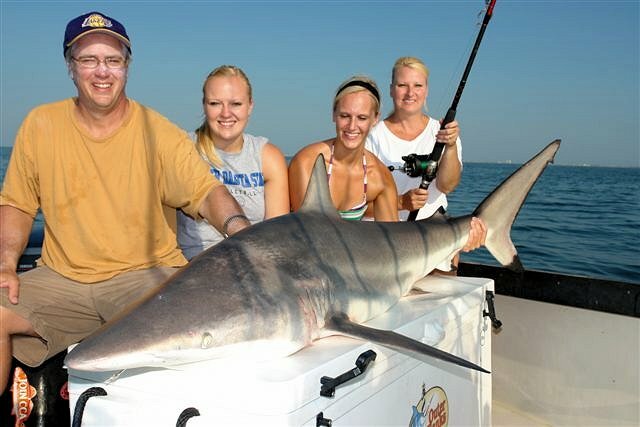 I chartered Captain Williams' boat for a 3 day offshore shark safari adventure for my whole family, which included my wife Peg and my two daughters Meg and Sherry. I really didn't know what to expect, never have been on a shark trip before.. .On the first day we left the marina just before the sun came up and by 8 AM my whole family was catching sharks and big King Mackerel. 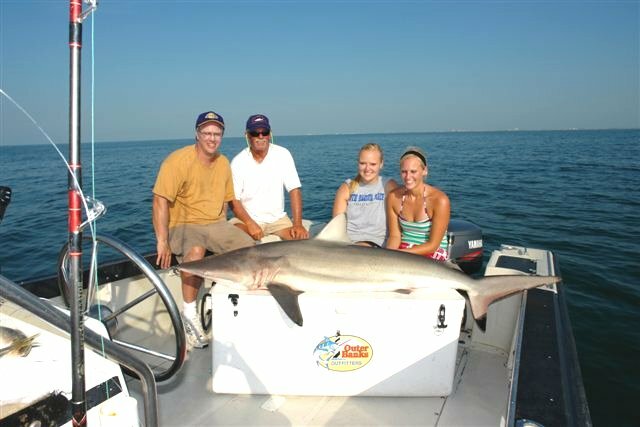 I think the first day my family and I caught over 40 sharks from about 40 pounds to well over 150 pounds. The second day was almost a carbon copy of the first, but now my family knew what to expect. .Captain Mike reminded me more of fishing with my, father, grandfather or brother than a charter boat captain. He baited the hooks for us, and all we had to was reel those big sharks in. ..On third day it was the same song third verse and my daughter Meg caught this really big King Mackerel which we photographed and released. By noon on the third day, we were toast, and literally worn out from catching fish and left the fishing area with the fish still biting. ..The 3 day adventure ended and my family has caught and released more than a 100 sharks. and some of the biggest King Mackerel I personally have ever seen. - The Walace Graham Family, Colorado Springs, Colorado. My buddy and our girlfriends fished with Capt. 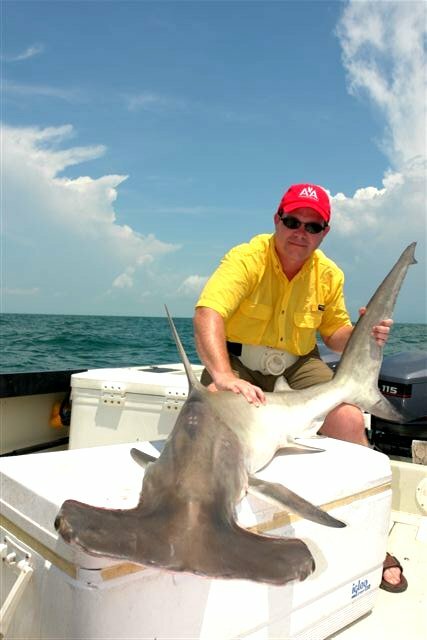 Mike Williams of Galveston Shark Fishing. Truthfully I can't remember having so much fun fishing. We caught sharks all day, and sorry to say, the girls caught most of them. I can say now that I finally went on a fishing trip where i got tried of catching fish. Thanks Capt. Mike for a wonderful day on the ocean. - Bobby Houston, Conroe, Texas. These days it's rare when you get more than you expect. 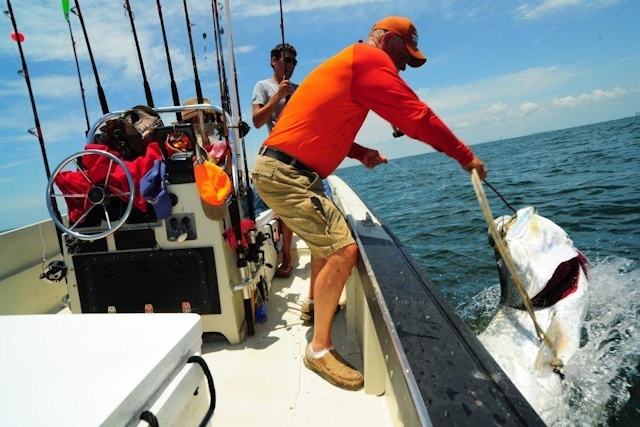 Fishing trips can go either way, but our fishing adventure with Captain Mike Williams of Galveston Shark Fishing was about as good as it gets. MAN, THOSE SHARKS ARE TUFF. Capt. Mike, my best friends and I had a ball on your boat, you are a hoot - Larry Wagner, Plano, Texas. 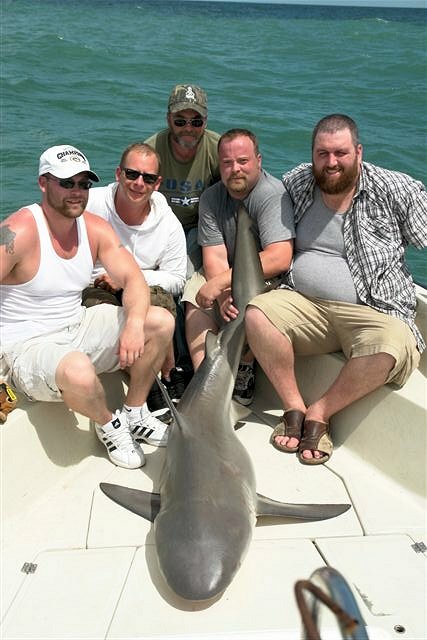 If you want to have a lot of summer adventure fun with your buddies, book a shark trip in August with Capt. Mike Williams of Tarpon Express. Capt. Mike is the shark man. Joe Mularkey, Paris, Texas. Fishing is all about the tug on your line. 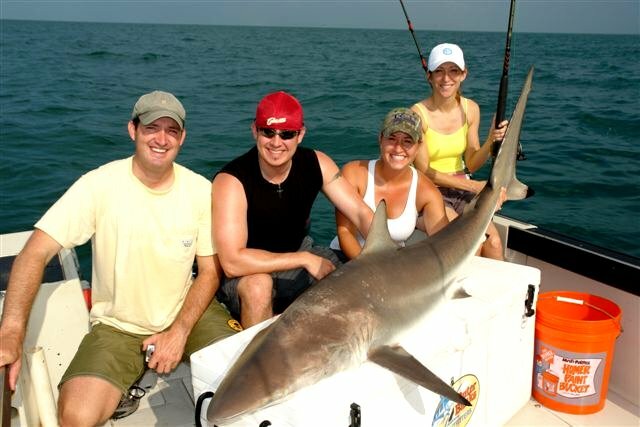 If you like big tugs try a shark fishing trip with Galveston Shark Fishing. The tugs are big. Thanks Capt. Mike Williams. Ben Franks, Houston, Texas. Had great time with some hard hitting fish with Capt. 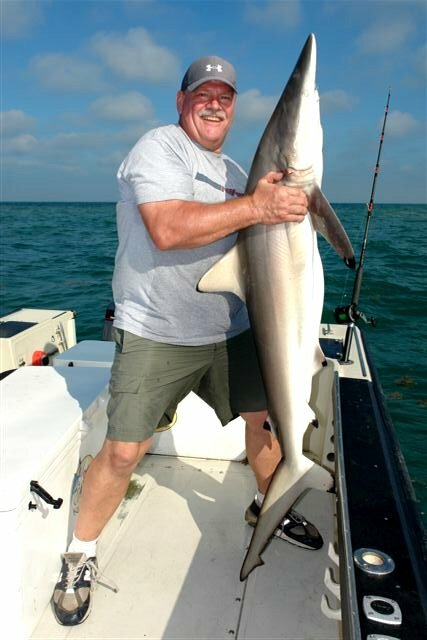 Mike Williams of Galveston Shark Fishing. - Barry Listor, Houton, Texas. 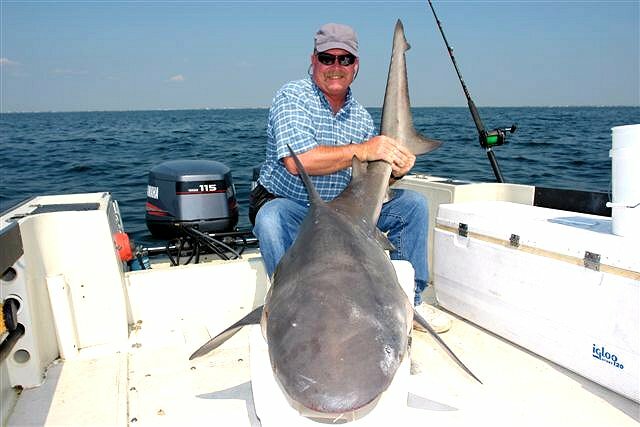 I always wanted to go shark fishing to feel the power of a big fish. Capt. Mike Williams of Galveston Shark Fishing, put us on some big fish with a lot of power, I mean a lot of power. Thanks Capt. Mike for a great trip -Wayne Land, Waco, Texas. Captain Mike, When the teachers at school ask what I did over summer vacation I will have a great fish story to tell! 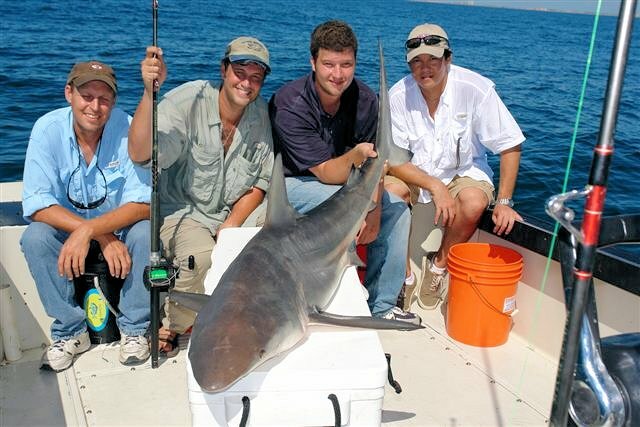 You put us on more sharks than we could reel in and threw in some huge King fish and a Jack as well. Thanks for the great time fishing and the great memories. Ben Hammel (14), Cypress, Texas. We had a great trip with Captain Mike Williams for our annual Father's Day weekend fishing trip. We caught lots of sharks, and my son Josh caught the biggest Tarpon that I have ever seen. We will definitely be using his service again, and I am recommending him to all my friends. He knows his stuff, and puts you on the fish. Joe Pruitt, Seabrook, Texas.